Dr. Francis Joseph O'Brien, Jr. (Waabu), has generously provided his extensive research on American Indian Place Names in Rhode Island to the RIGenWeb Project. There are over 1600 entries covering all of RI based on about six major sources from the Colonial Records through the U.S. Government's data based on the GNIS (Geographic Names Info. System). The Federal Government gives us only about 185 contemporary names of Indian origin in RI. But there are over 500 names that have been part of our history. This database provides general locations where the names can be found, as well as the meaning and cross references to the more common variations of the spelling. American Indian Place Names in Rhode Island: Past and Present is a continuation of the Massachusett Language Revival Program, initiated under the aegis of the Aquidneck Indian Council in Newport, RI, and documented in the publications held by the U.S. Library of Congress. The present volume details the Native American historical contributions to the landscape of the State of Rhode Island and Providence Plantations. The Federal Government, under the agency of the Geographic Names Information System (GNIS) is responsible by law for standardizing all geographic name usage for the United States Government. This complex system currently possesses about 5,665 names of "features" wholly or partially in Rhode Island. Of this population, the author counted about 187 names that are, or believed to be, of American Indian origin (primarily the Narragansett language, with contributions from the Niantic dialect and Nipmuck). Extending a records search back to Colonial times (circa 1636) offered the possibility of cataloguing an historical database. Approximately 534 names of Indian origin were traceable back to the now extinct languages, synthesized from various and sundry sources (listed in the References & Bibliography section). This number is a better estimate of the Native American contributions to the historical and geographical landscape of Rhode Island. When variant spellings are accounted for in the records, about 1,600 individual entries are documented. The structure of the book is straightforward. The main body of the text is presented in tabular format, consisting of three columns with headers Names, Historical and Geographical Information, and Translation. On the left side is given the Native American place name; each variant spelling is included separately with a reference back to a primary entry which contains information in each column. The middle column is important. Approximately 400 of the entries in this column were abstracted from Dr. Usher Parson’s 1861 book, since this source provides more elaborate data that any other single source. But it must be remembered that, while Parsons is cited nearly verbatim, his historical reference point is up to only the year 1861, and some information listed may not apply to the year 2003. It was included because of its historical significance to the place name literature. Moreover, Parson’s linguistic data must be discounted almost entirely since Algonquian linguistics was not a mature science in his day. The right hand column provides linguistic translation(s) for a given place name. I have drawn heavily from the standard comprehensive work of Prof. Huden, with a modest contribution by the author. The degree of orthographic corruption in some place names offers a real challenge to the linguist. Alternative translations for some names may seem peculiar, but the name "noise" sometimes permits but an approximation to the true language roots and the translation. The Rhode Island American Indian Place Names research and documentation project of the Aquidneck Indian Council was made possible with the generous support of many people, organizations and institutions. Many research and records facilities throughout the country contributed to the listings and supporting documentation. We list all those that can be recalled from memory in November, 2003. In Rhode Island we must mention the Office of the Governor of the State of Rhode Island and Providence Plantations (and Governor D. L. Carcieri), The Rhode Island Office of the Secretary of State, Division of State Archives and Public Records Administration, The Newport Historical Society, The Rhode Island Historical Society Library, The Rhode Island Historical Preservation and Heritage Commission, Heritage Harbor Museum, The Black Heritage Society, The John Carter Brown Library at Brown University, Middletown Public Library Interlibrary Loan Program, Maine State Library (Augusta, Maine), the Making Of America Digital Library (University of Michigan and Cornell University, funded by the Andrew W. Mellon Foundation), Rhode Island Council on the Humanities, Rhode Island Foundation, Expansion Arts, Rhode Island State Council on the Arts, West Warwick Public Library, Rhode Island College Adams Library, University of Rhode Island Special Collections Library, The Rhode Island Department of Education, Mark Patinkin of The Providence Journal, Newport (RI) Daily News, Newport This Week and many other regional newspapers and presses, the Town Councils of Aquidneck Island (Portsmouth, Middletown and Newport) , Dr. David Shonting, Narragansett Indian News, Providence Public Library, the Rhode Island Indian Council, and The Narragansett Indian Tribal Nation. In nearby Massachusetts we were assisted by the Boston Public Library and Harvard University. We thank the Bureau of Indian Affairs (US Department of the Interior), and all the tribes and Councils of Southern New England. We thank the Mashantucket Pequot Library and Research Center, and Connecticut Historical Society in Connecticut. Other academic libraries providing information and records include Princeton University, University of Pennsylvania and Yale University, The Naval War College and Naval Undersea Warfare Center of Newport, RI. The United States Library of Congress allowed electronic access to numerous American, Canadian and European scholarly research libraries. We also acknowledge Mr. Roger L. Payne, Executive Secretary, and Julie Pastore, of the U.S. Geological Survey & U.S. Board on Geographic Names, Geographic Names Information System (GNIS), and The Library of Virginia. Finally, the author extends special gratitude to three people. Many thanks are extended to Dr. Ives Goddard, Senior Linguist of the Smithsonian Institution and Professor George Aubin, Assumption College, our most eminent American Algonquian linguists, whose dedicated and scholarly works of the past two-and-one-half score-years have keep alive the words and spirits of the American Indian tongues of the Aboriginal Peoples of the Great State of Rhode Island and Providence Plantations. Last and not least, Susan Pieroth, Coordinator of the RIGenWeb history and genealogy website provided the technical wherewithal to upload this database and patiently append corrections and additions so that all worldwide viewers may know of our rich heritage, and all WWW visitors and correspondents throughout the world. As always, my daughter, Miss Lily Rae-O'Brien, is the guiding light in all my earthly works. Our English, French, Irish, African American and Indian heritage serves this great land of ours. God Bless the United States of America. May she live forever! * Foster, John. Map of New England [woodcut.] In The Present State of New-England. 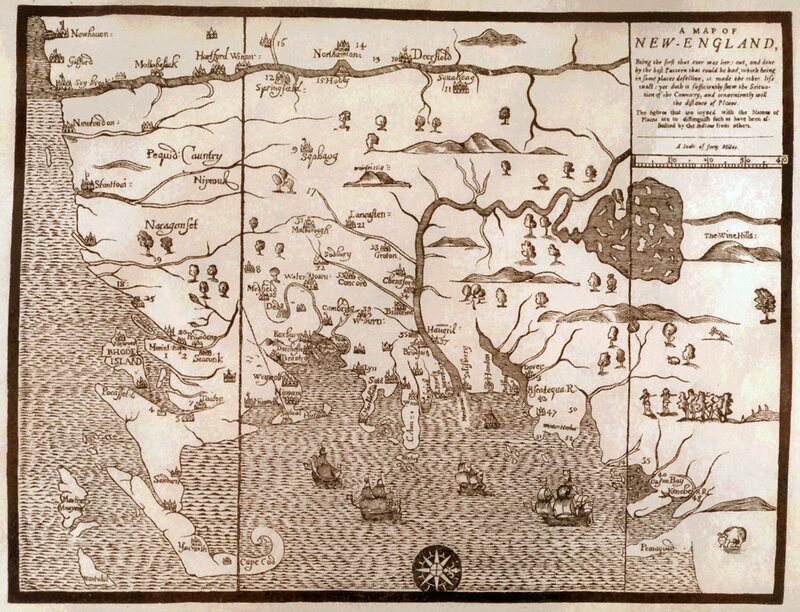 Being A Narrative of the Troubles With the Indians In New-England, from the First Planting Thereof in the Year 1607, to this Present Year 1677. But Chiefly of the Late Troubles in the Two Last Years 1675 and 1676. To Which is Added a Discourse About the War with the Pequods in the Year 1637. William Hubbard. London: Printed for Tho. Parkhurst; Boston: John Foster, 1677. The numbers indicate places which had been assaulted by Indians. The numbers correspond to the Table of Towns and Places which follows p. 132 in the Hubbard volume. This material my be used for personal use, and may be quoted in publication, as long as these sources are cited: 1) Dr. Francis Joseph O'Brien, Jr., author, and; 2) Rhode Island USGenWeb (RIGenWeb) Project. Learn more about Frank Waabu O'Brien, Ph.D.
You are the [an error occurred while processing this directive] visitor to this page. Thanks for stopping by.